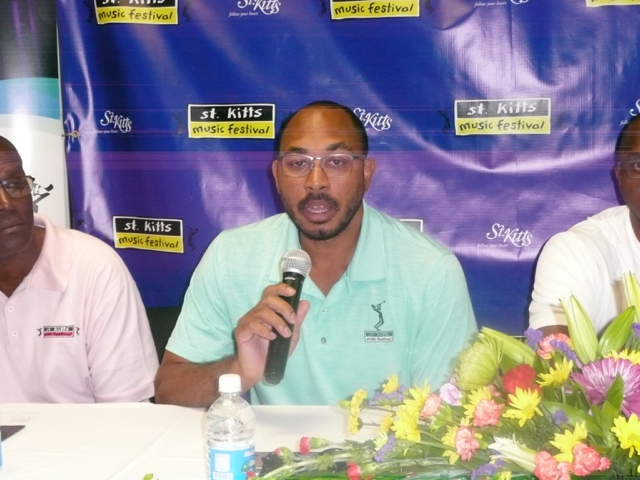 Ambassador Jonel Powell, chairman of the St. Kitts Music Festival Production Committee today announced the hosts and DJs for the three nights of the 2018 edition of the St. Kitts Music Festival. In a press conference held 5th June at the Ministry of Tourism conference room, Powell said the committee was responding to several challenges observed over past years. “We have had some challenges in relation to the change-overs between acts, so we have worked with the stakeholders, sponsors, and everyone has been able to compromise and come up with a nice solution for entertainment during the change-overs, as well as giving the sponsors their money’s worth,” Powell explained. Entertainment during the change-overs will be provided by designated hosts and DJs. Hosting Thursday night’s concert (28th June) is local duo Pinocchio and SugarBowl. That night will also feature one of the two finalists from the Music Festival DJ Competition. On Friday, 29th June, popular Sweet Sister Sensia and guest host Jabba of Hot 97 FM, New York, will keep the crowd jumping. “Both are DJs in their own right, and so they will be hosting and D-Jaying together on that particular night,” Powell said. The Saturday night DJ will be the second finalist of the DJ Competition. Well-known radio personality GCue will host the Saturday night concert, joined by guest host Karlie Redd of Love and Hip Hop, Atlanta. Powell is alerting patrons not to come late to the shows, as they will start on time and end at 1 am each concert night. Powell revealed only the opening acts for the various nights. On Thursday night, Destra fires up the venue with her usually heated performances. On Friday night Chackademus and Pliers will start the night of performances, and on Saturday night, the show starts off with Rhythm of the Beat.